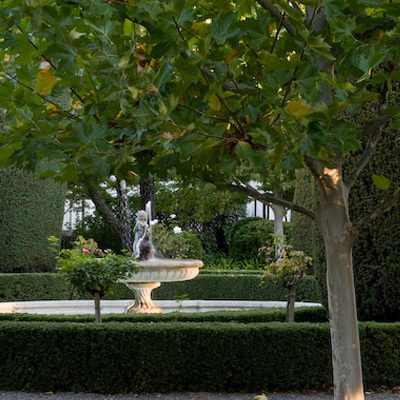 To view photographs of the Beaulieu Garden, click on the yellow text links below. 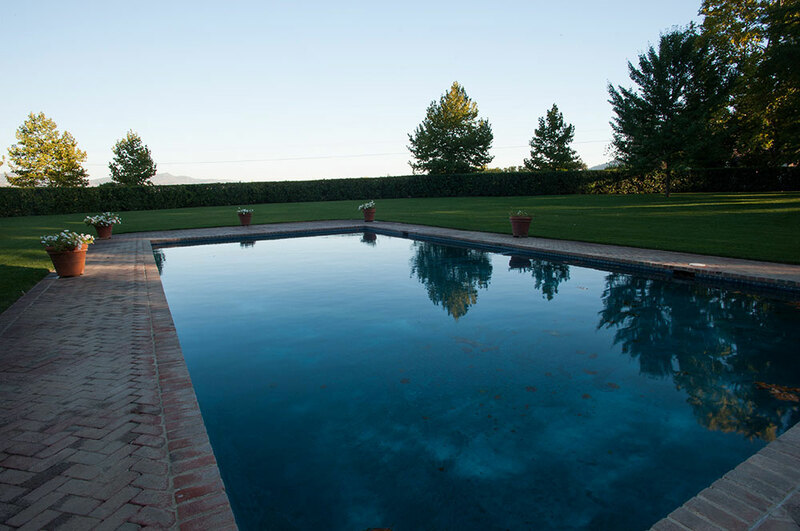 To return to 'The Property' view, click on the 'Map' button. 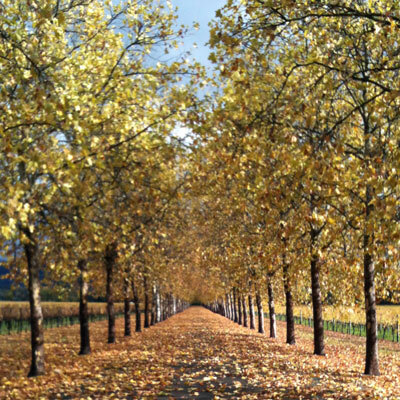 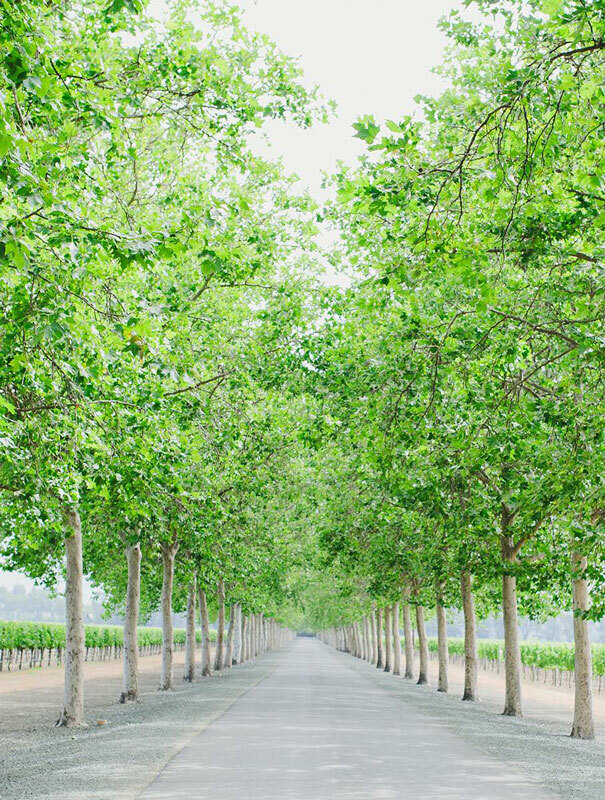 tree lined driveway of 146 mature sycamores. 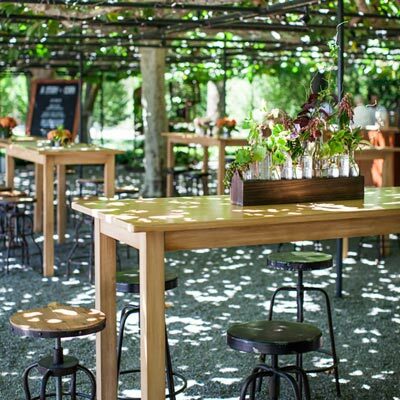 The beautiful arbor was designed by Thomas Dolliver Church following the desire of the de Latours to create a classic European themed space. 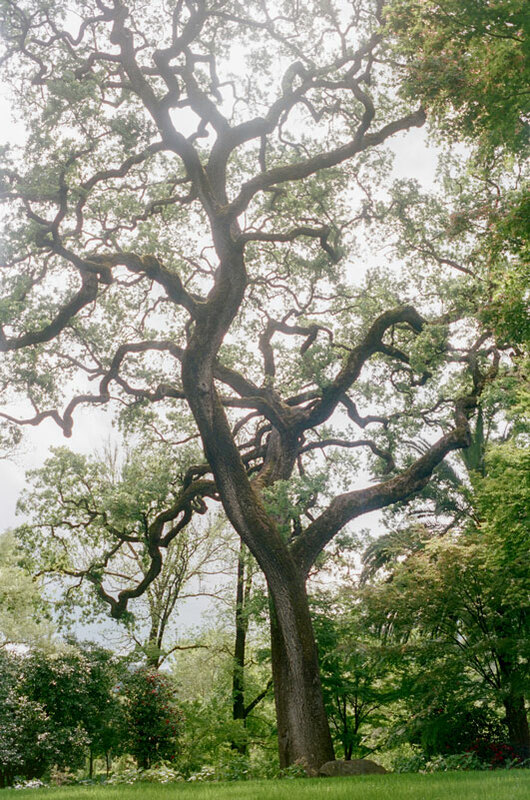 It is one of the oldest and largest arbors in the United States. 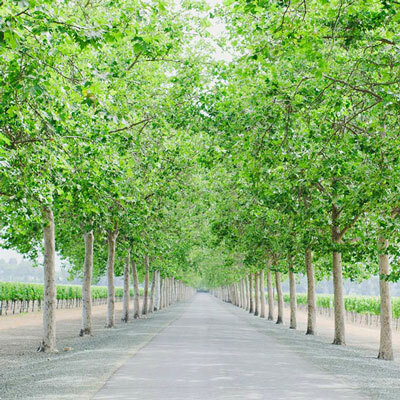 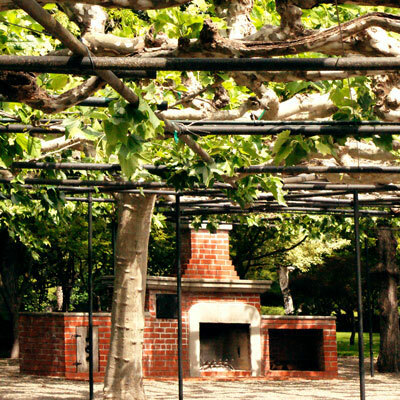 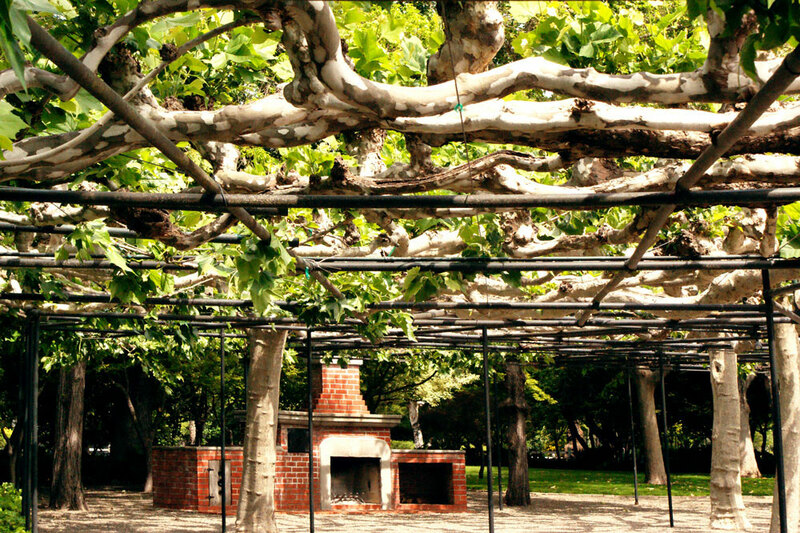 Forty-eight sycamore trees were planted in the early 1920s to resemble the pollarding technique found in many European villages and cities providing a wonderful shady canopy for entertaining during the spring, summer and autumn months. 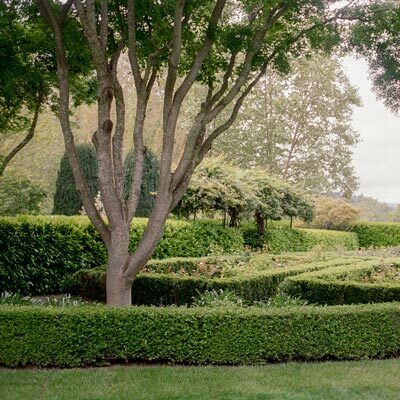 This section is adjacent to a swimming pool and large lawn encircled by a laurel hedge. 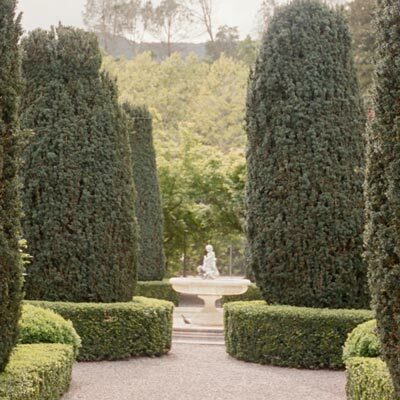 Roses, English boxwood, yew trees, and jasmine make up this multi-level landscape design area also by Thomas Dolliver Church. 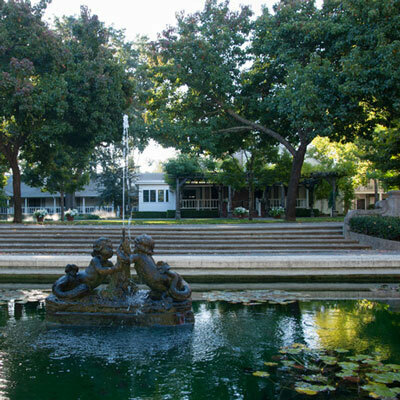 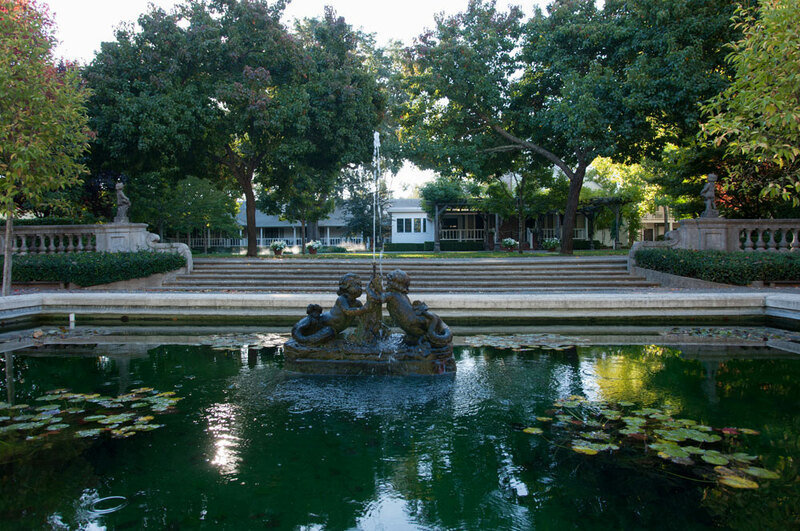 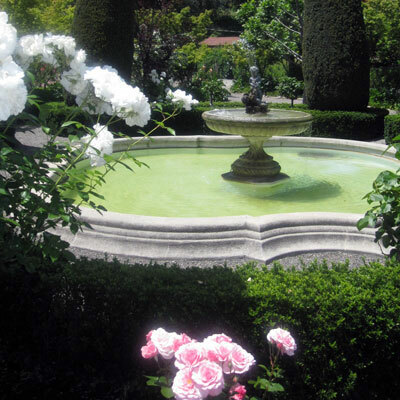 The theme includes a European pool with lily pads, a cherub fountain, balustrades holding up additional cherubim, and an antique sundial. 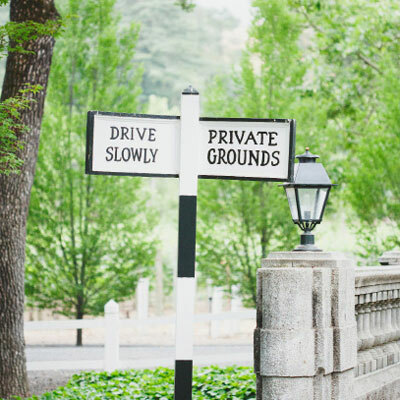 This area is used for weddings and commercial events. 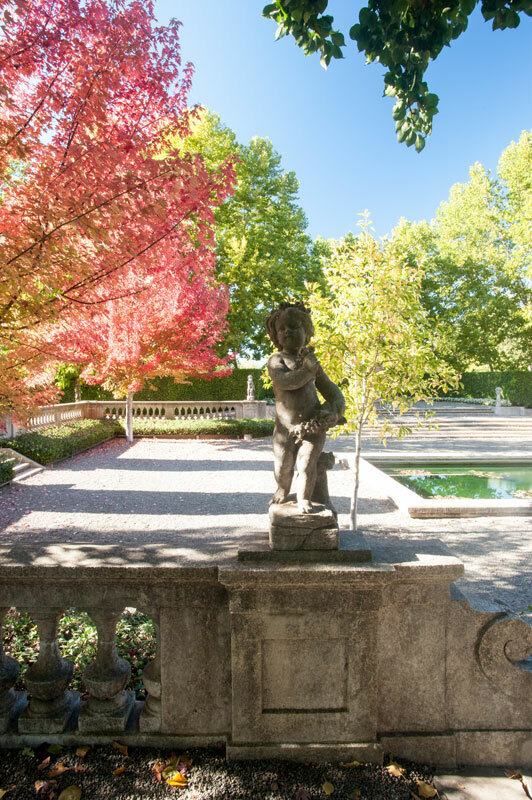 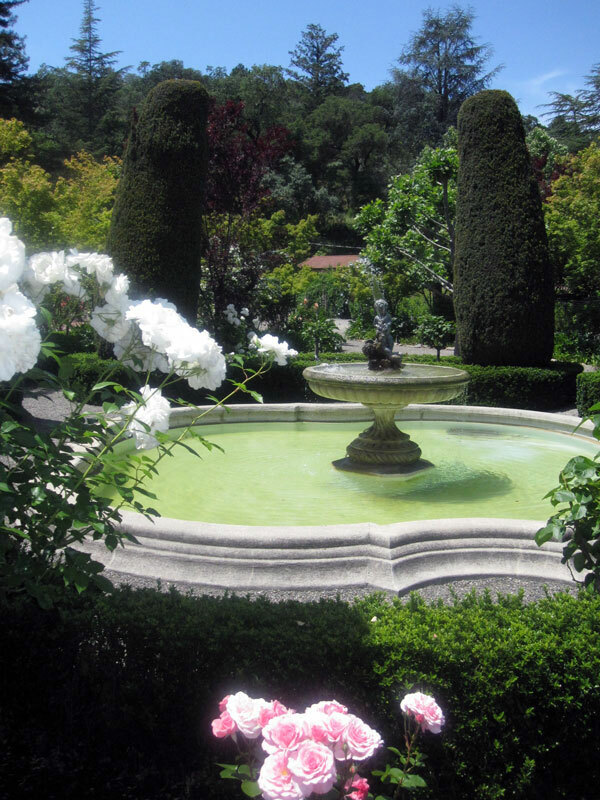 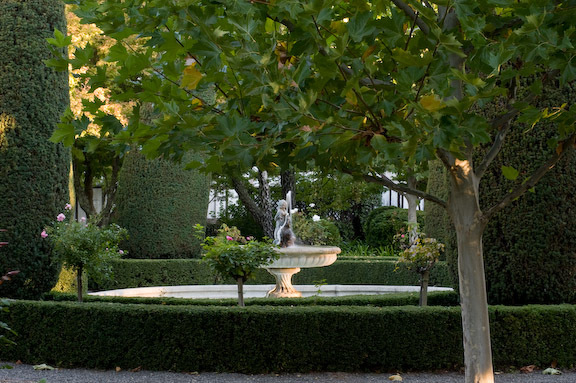 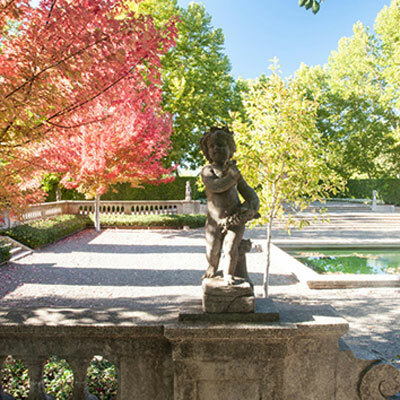 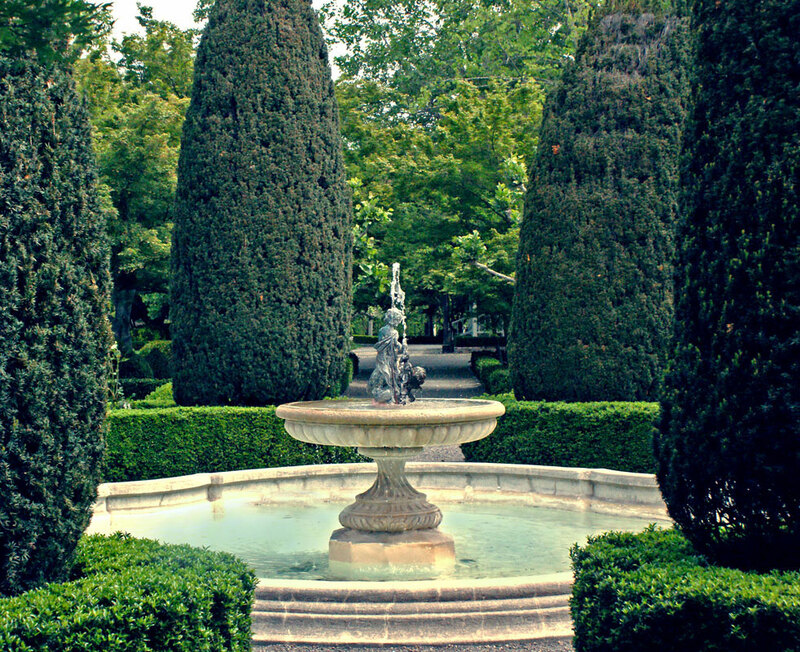 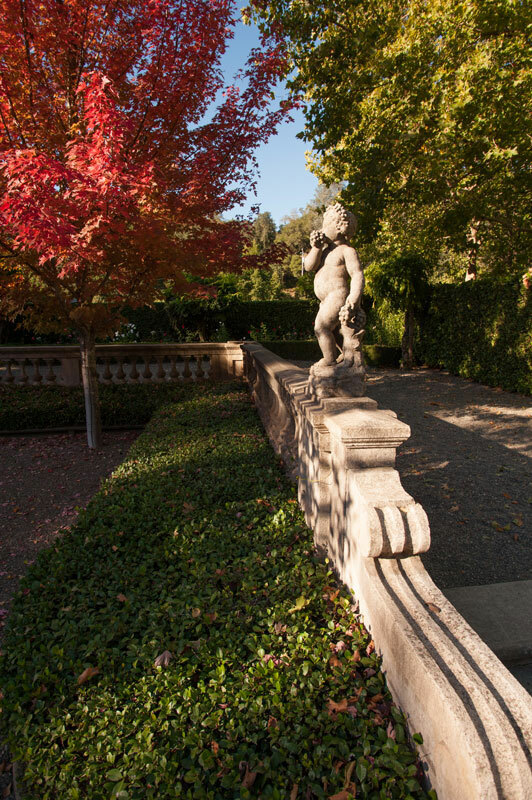 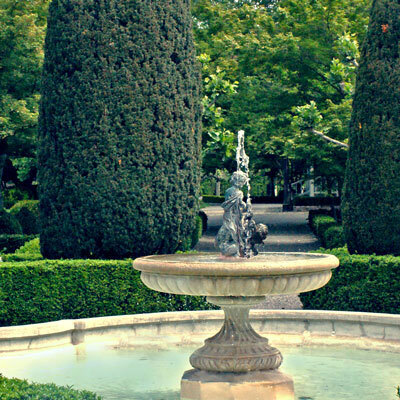 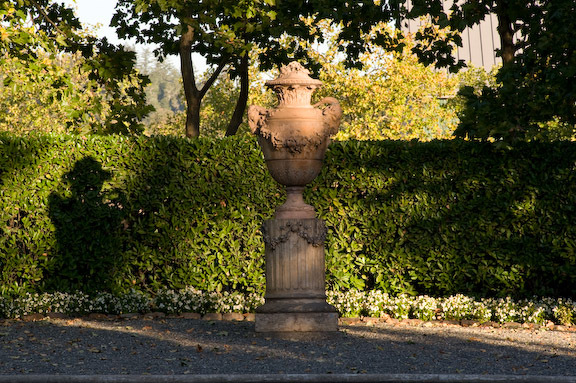 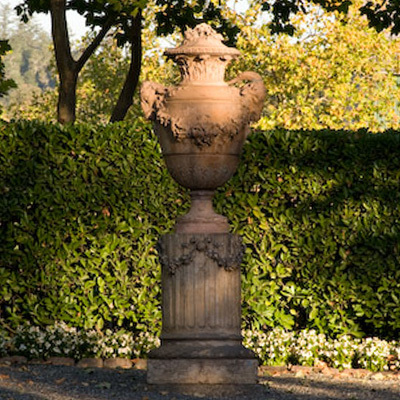 This section of the property follows a formal Italian design using a circular large water fountain, English yew trees, magnolia tree, tree roses, and English boxwood with topiary figures, beautiful dogwood, daphne, and climbing roses adjacent to a tennis court. 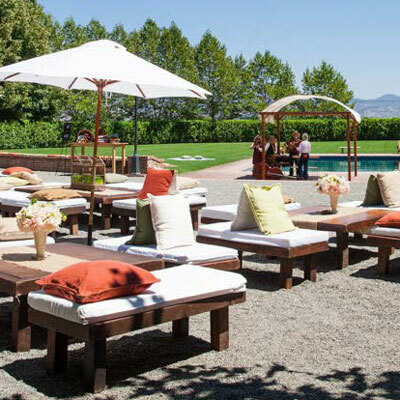 Wedding receptions and commercial events are conducted here. 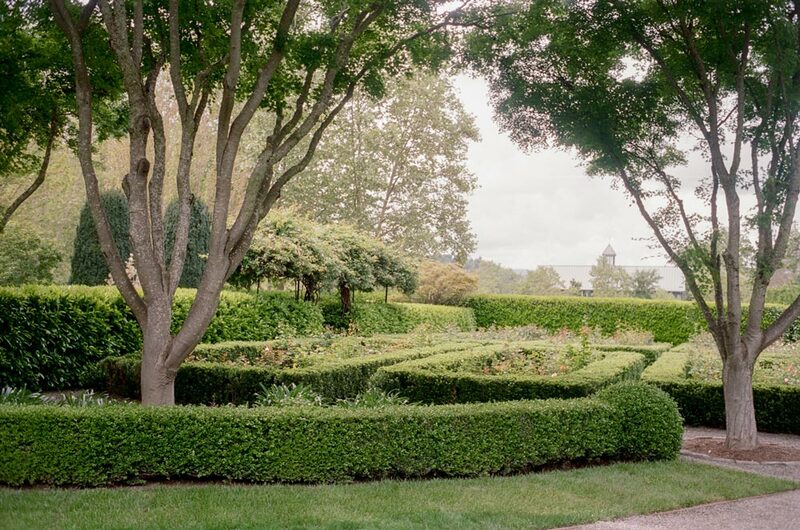 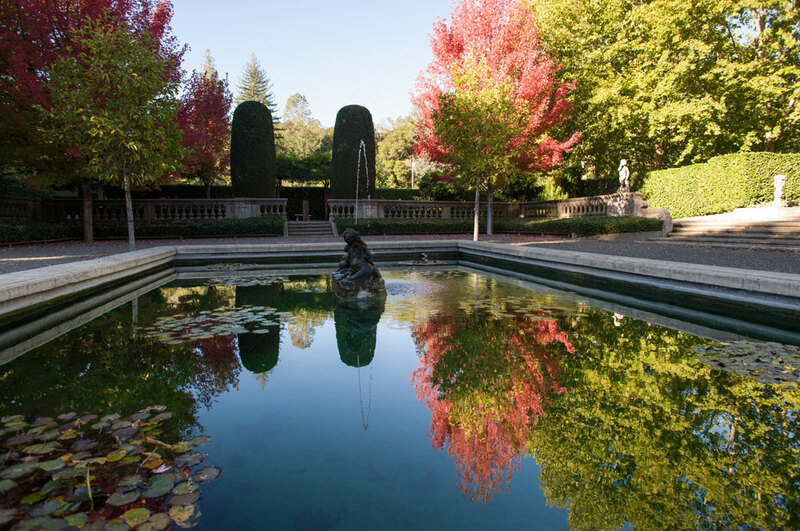 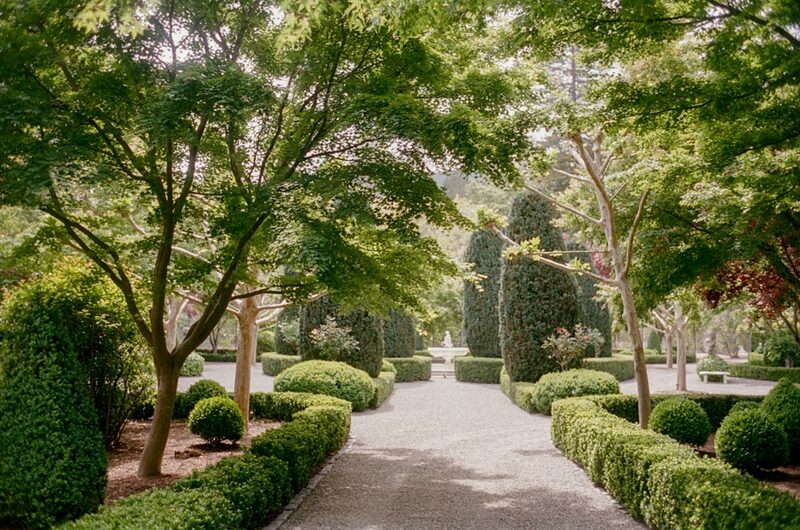 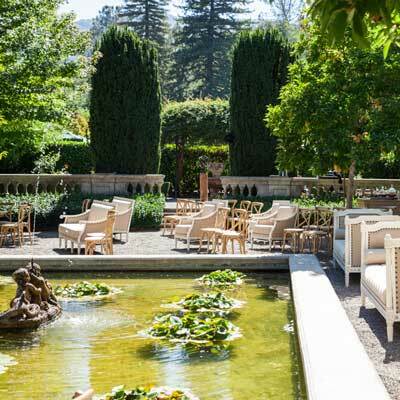 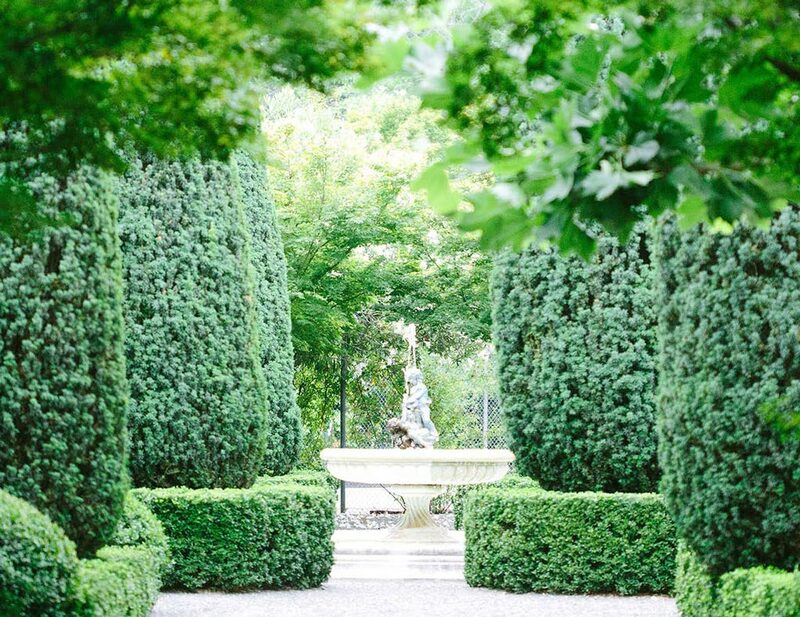 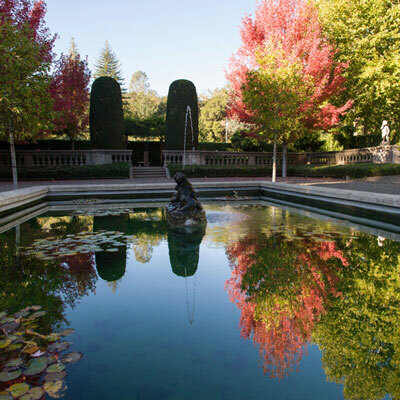 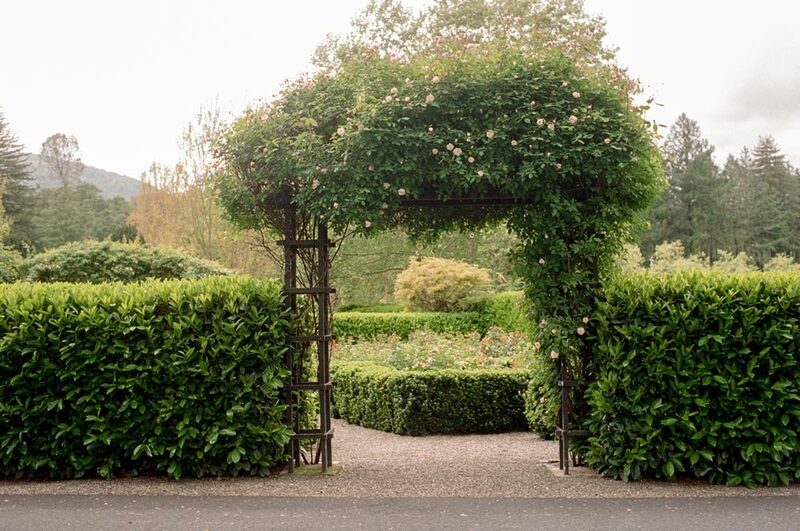 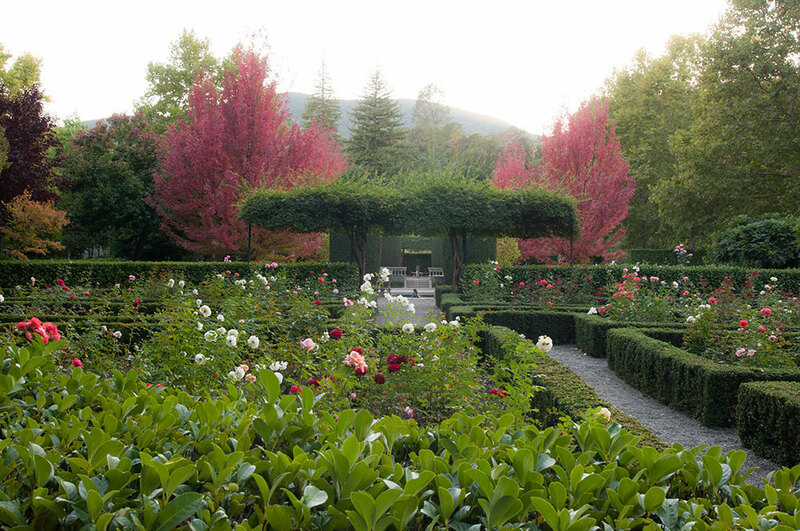 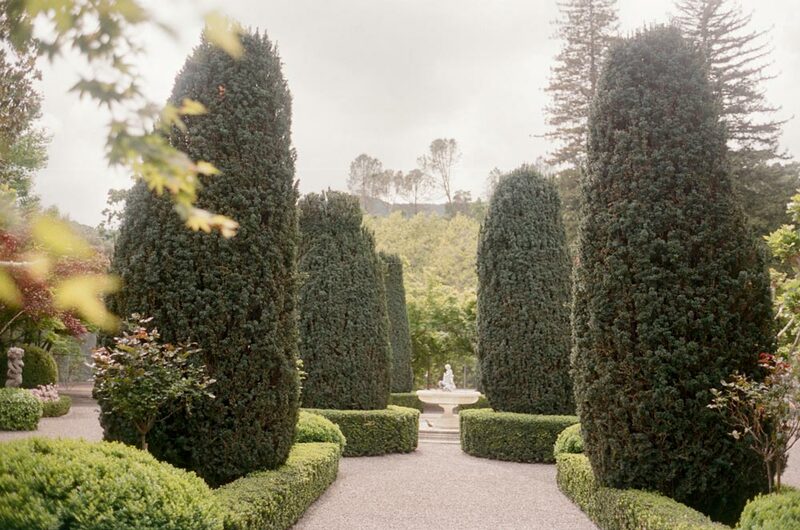 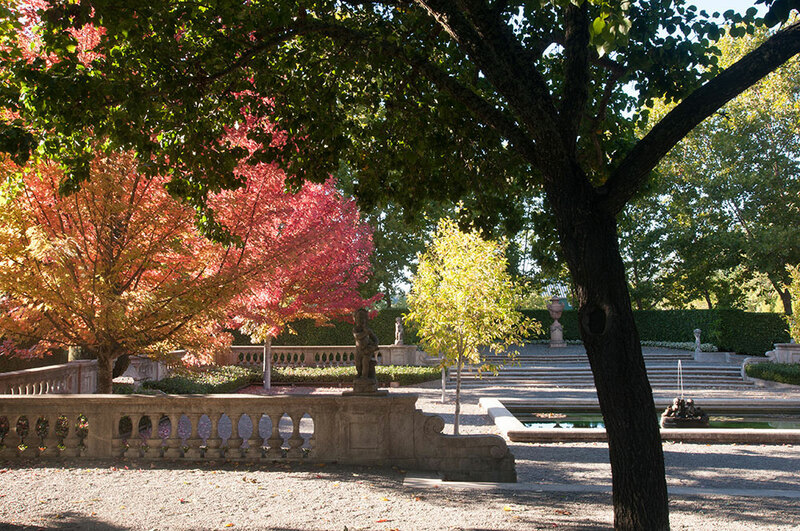 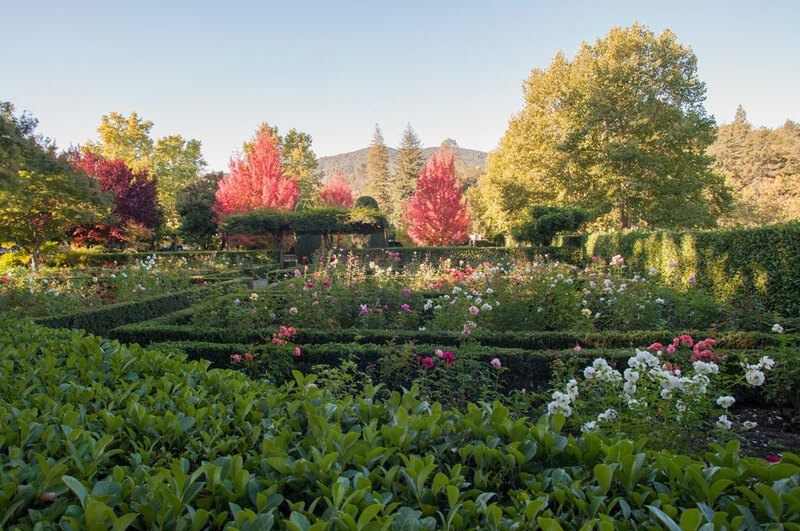 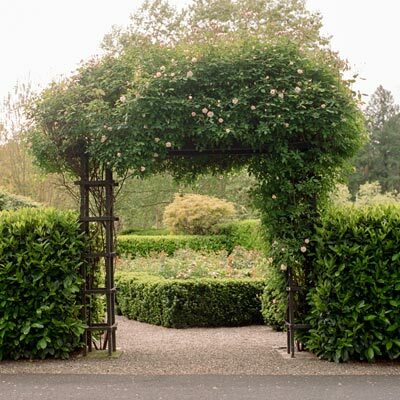 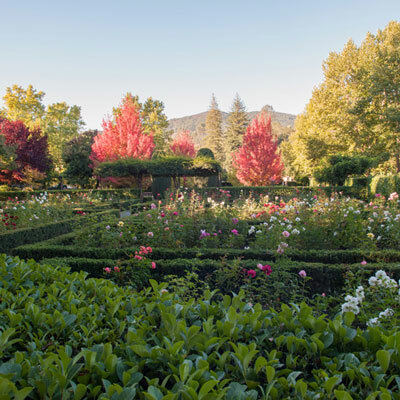 Planted in the 1910s, this formal French-style garden includes 300 hybrid tea rose bushes encompassed by English boxwood and maple trees, all surrounded by laurel hedges on three sides. 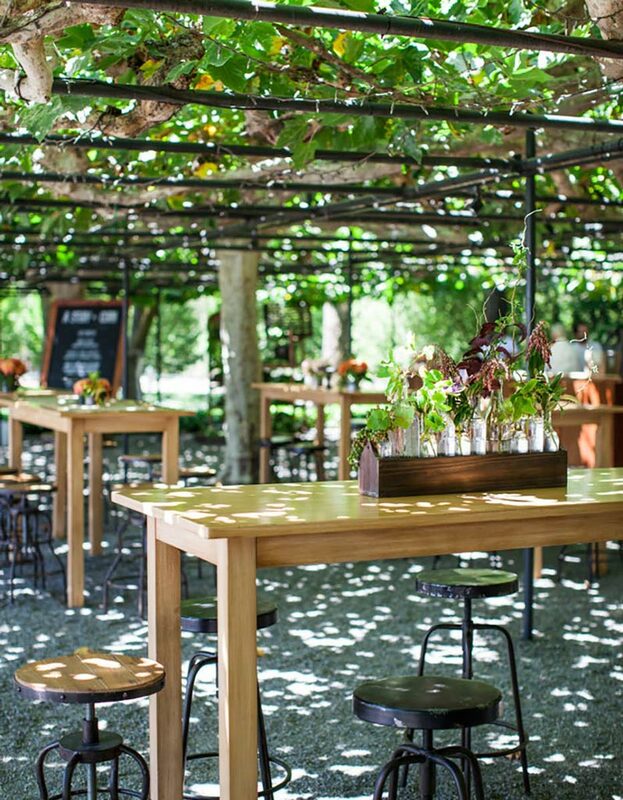 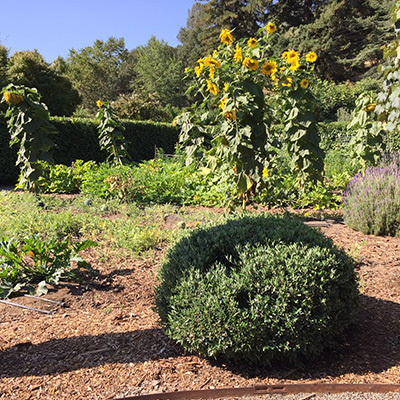 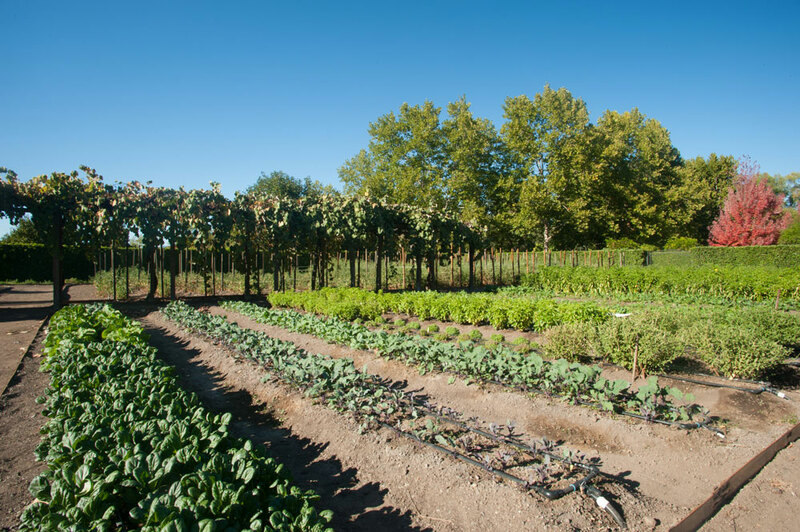 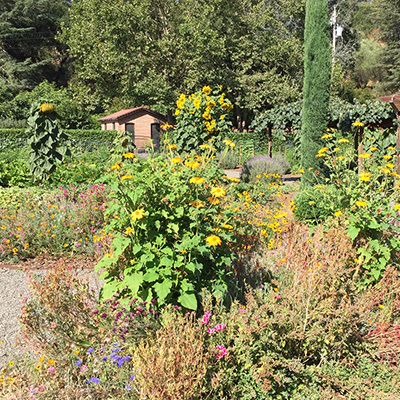 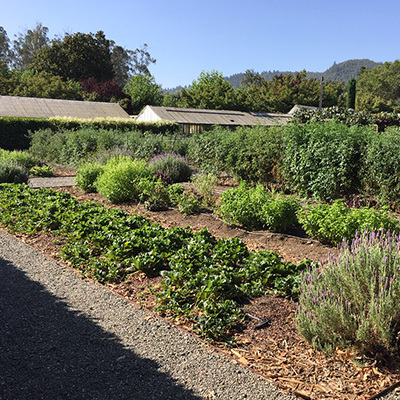 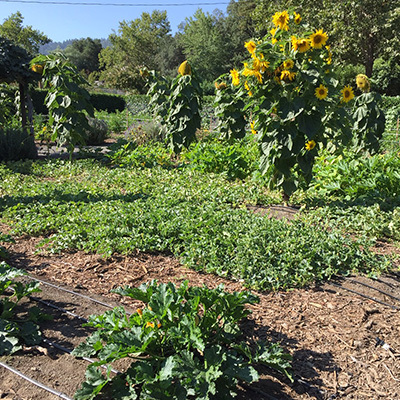 Used by the de Latour family for over 100 years, this garden and orchard uses biodynamic planting methods dating back to the French ancestry of the property and produces “farm to table” produce, fruit, and fresh herbs. 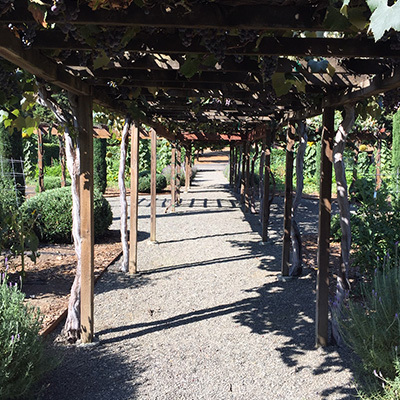 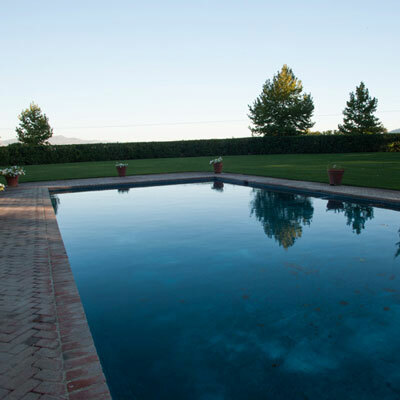 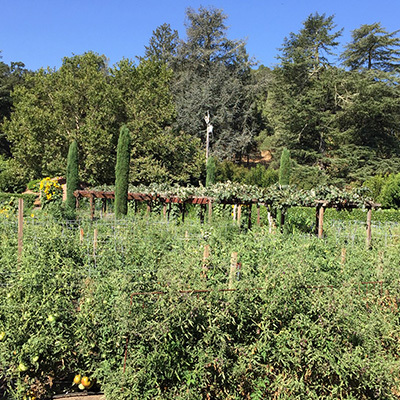 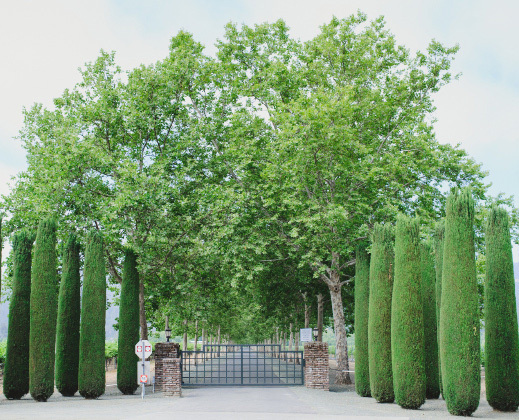 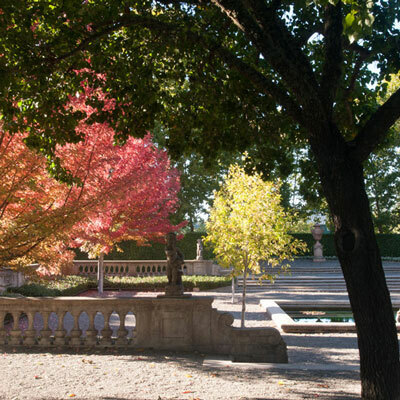 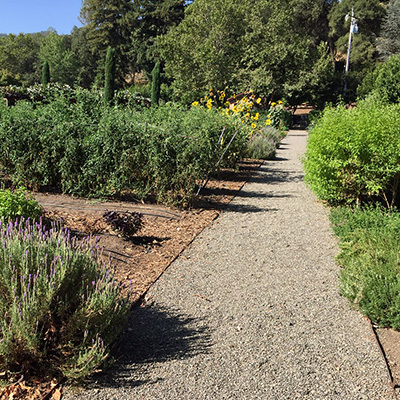 The garden includes Cypress trees, olive trees, and a table grape arbor with orchard surrounding the vegetable garden. 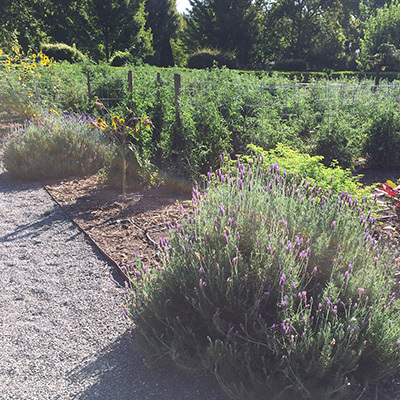 Two hot houses are adjacent to the garden for purposes of growing and transplanting seeds. 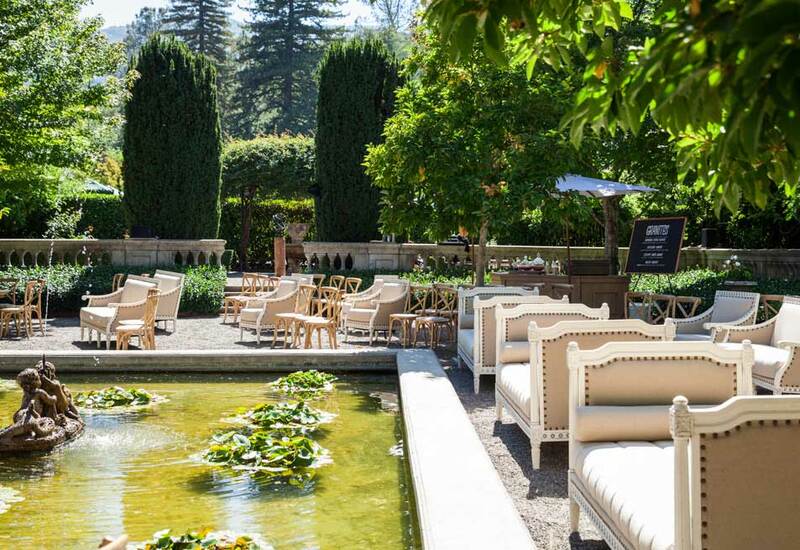 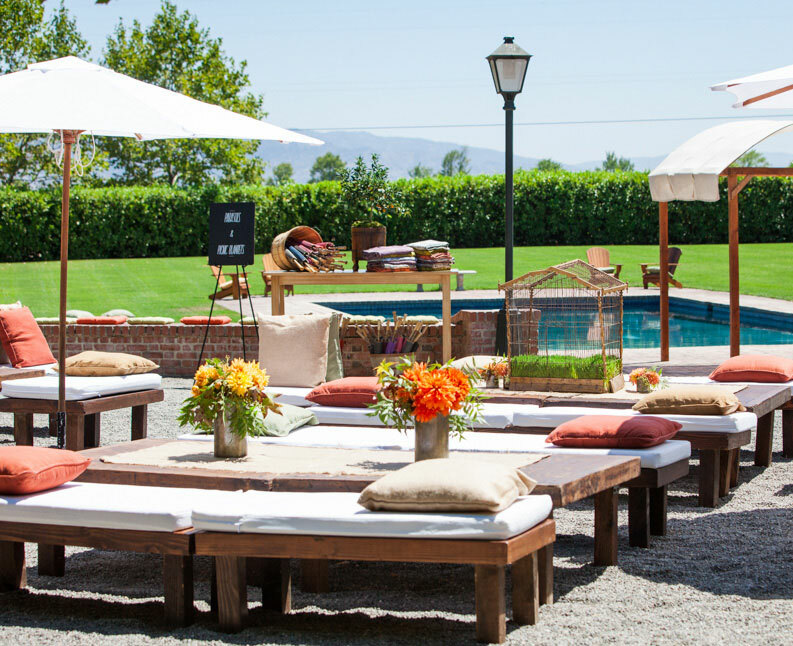 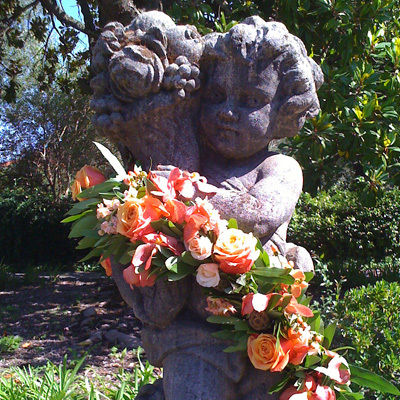 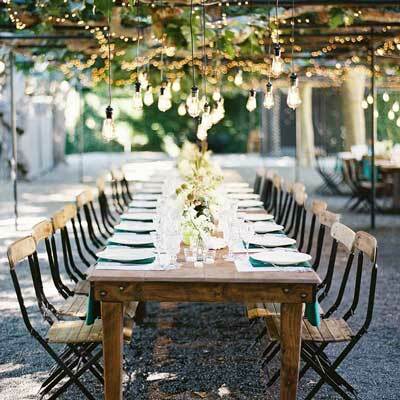 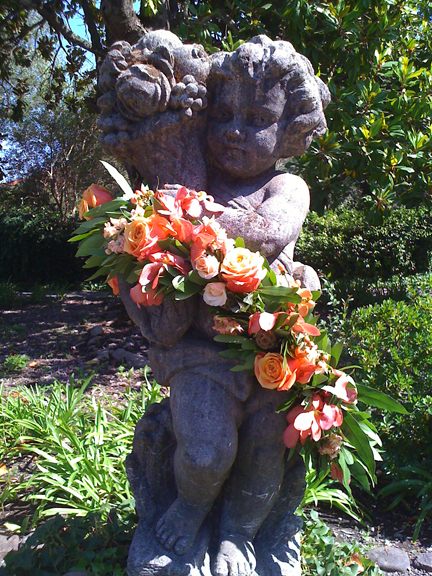 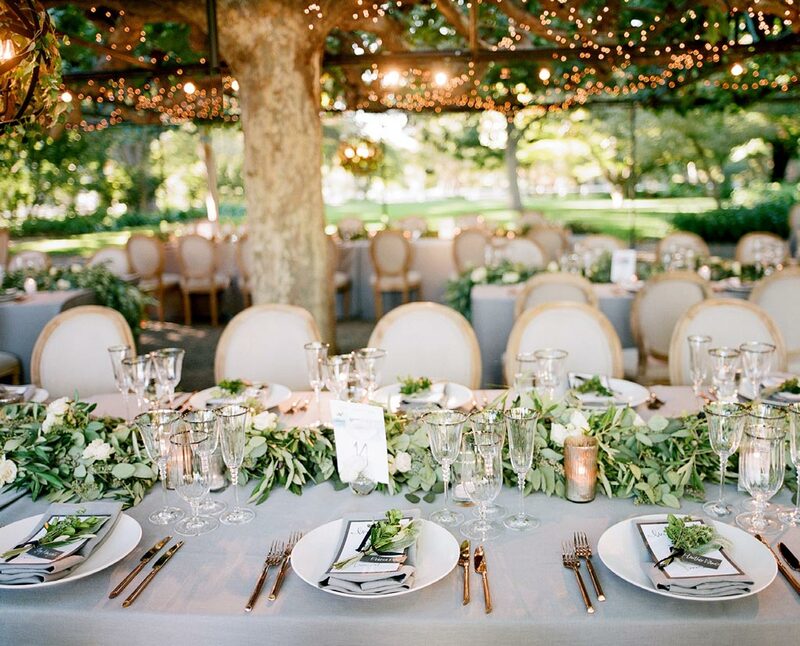 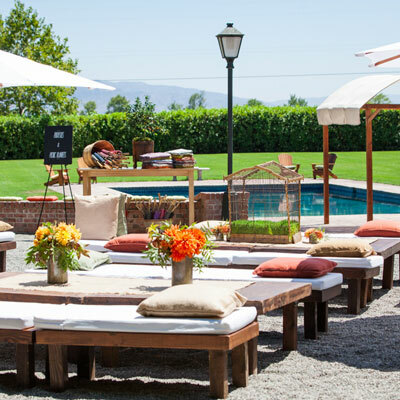 Paula LeDuc Fine Catering & Events manages the garden, in partnership with the family. 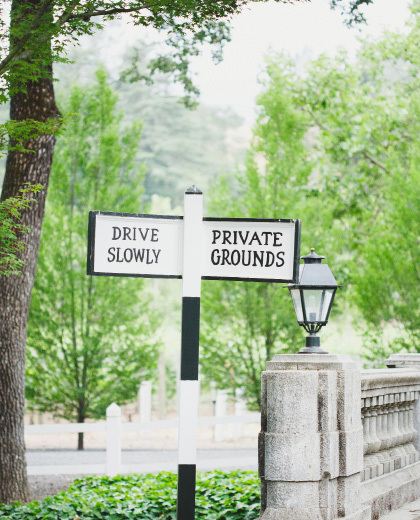 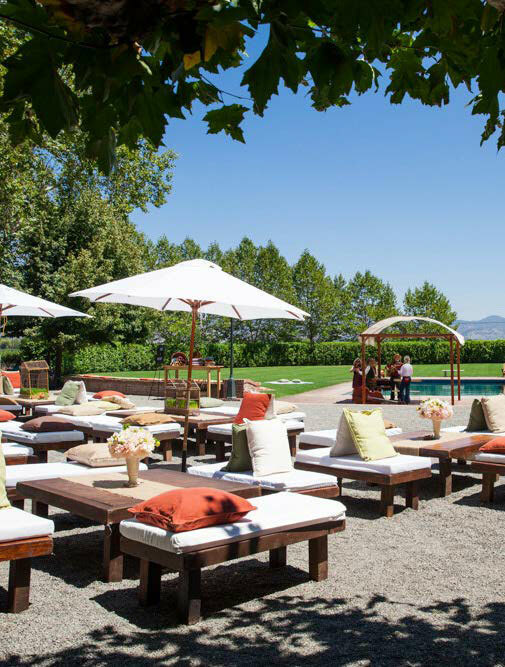 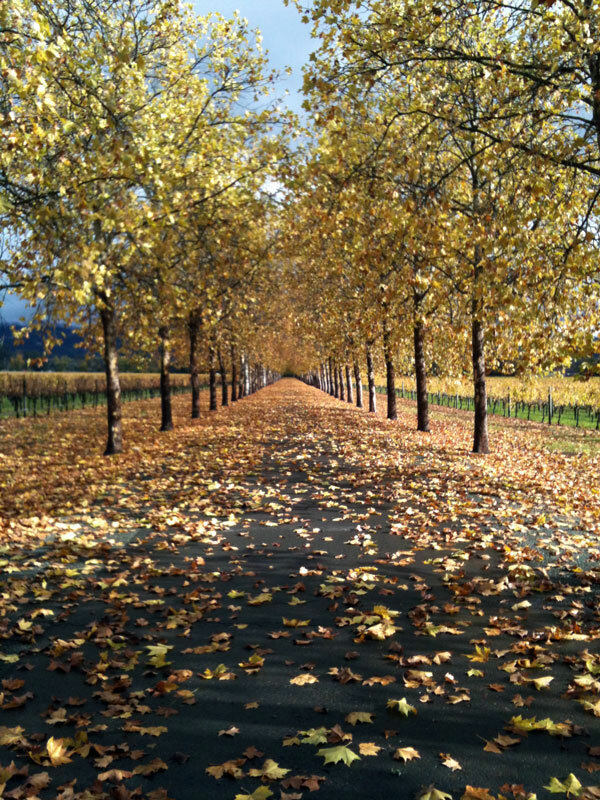 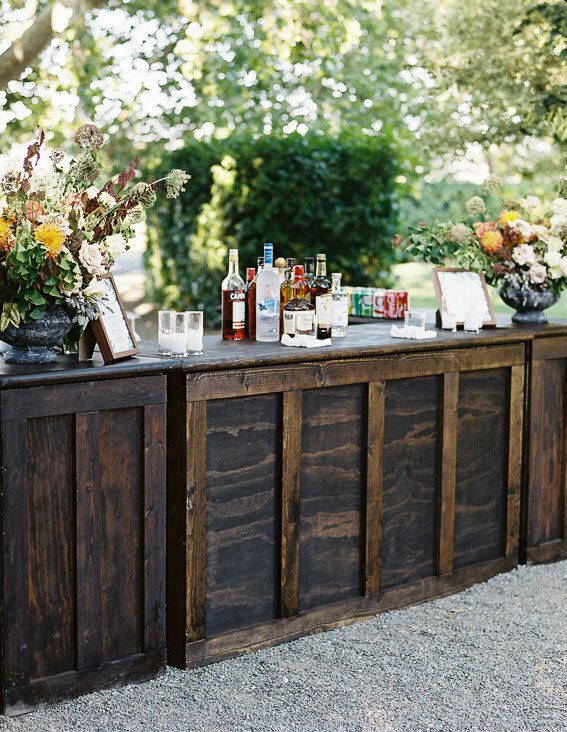 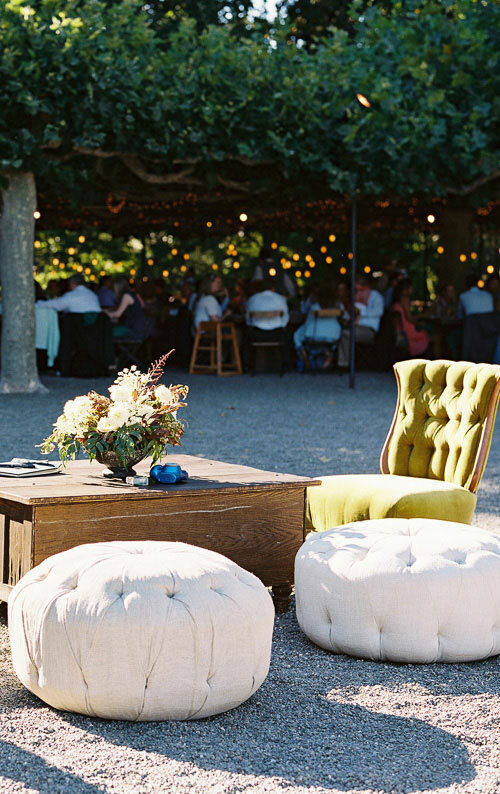 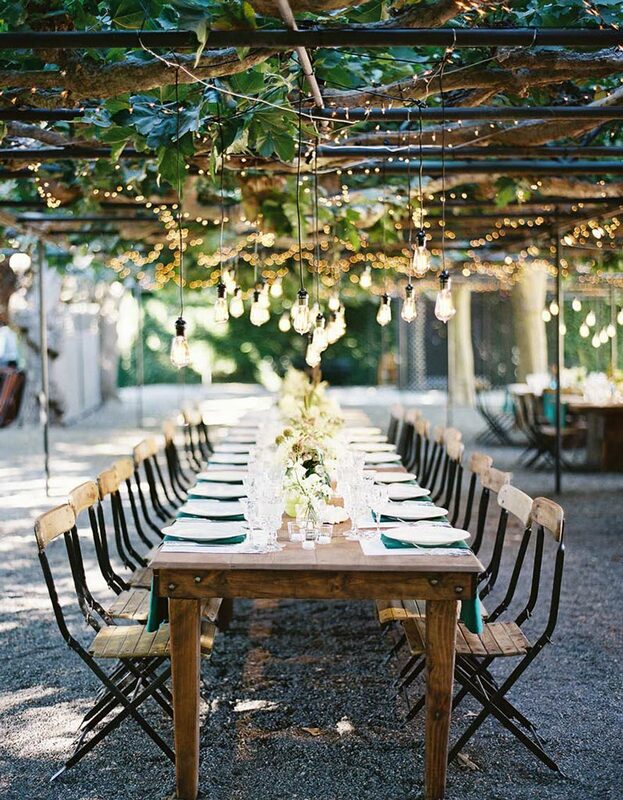 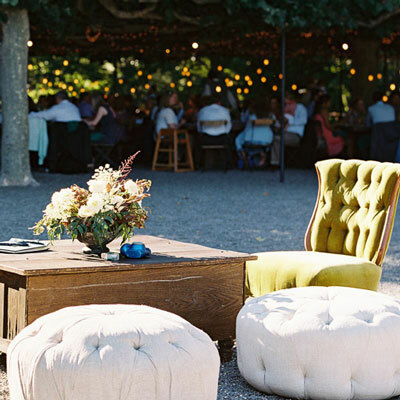 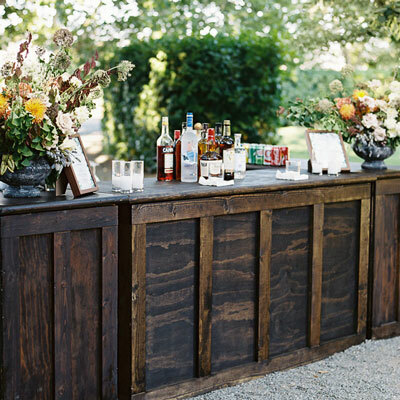 The vineyard welcomes admirers and event participants in all seasons. 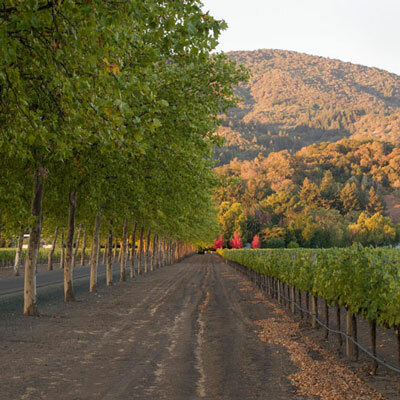 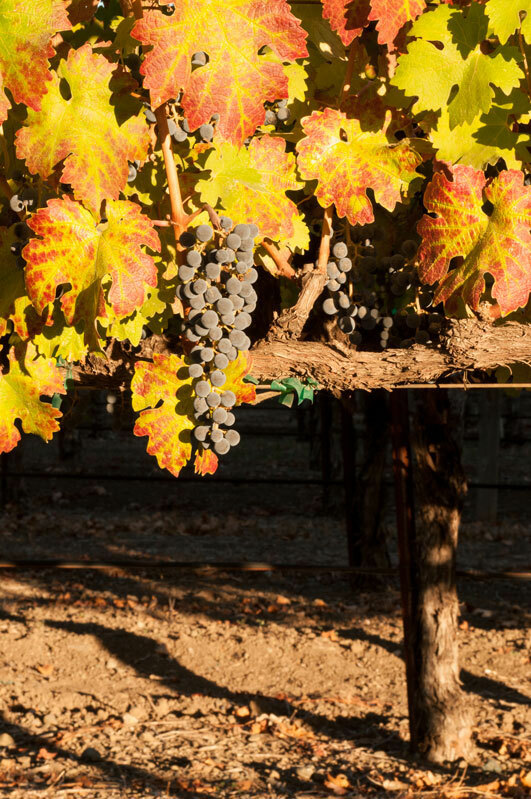 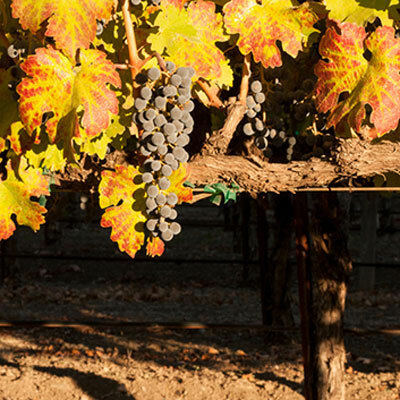 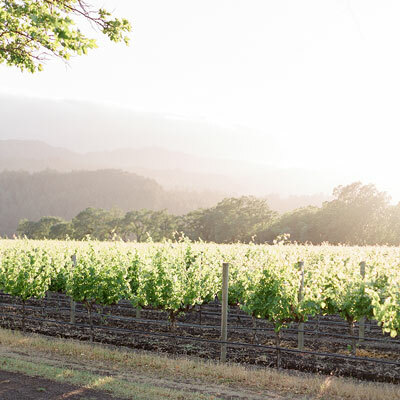 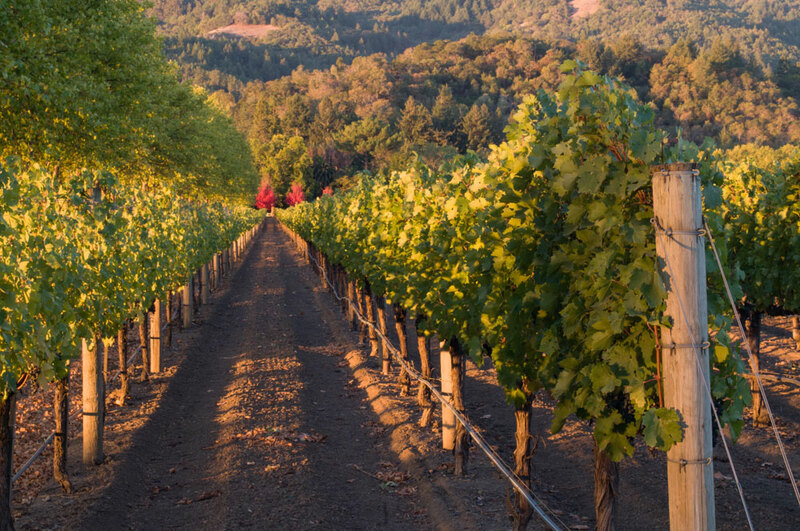 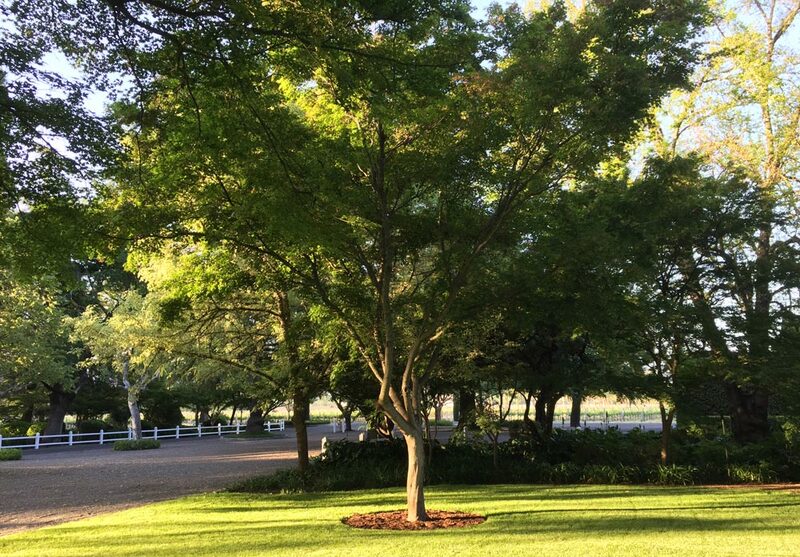 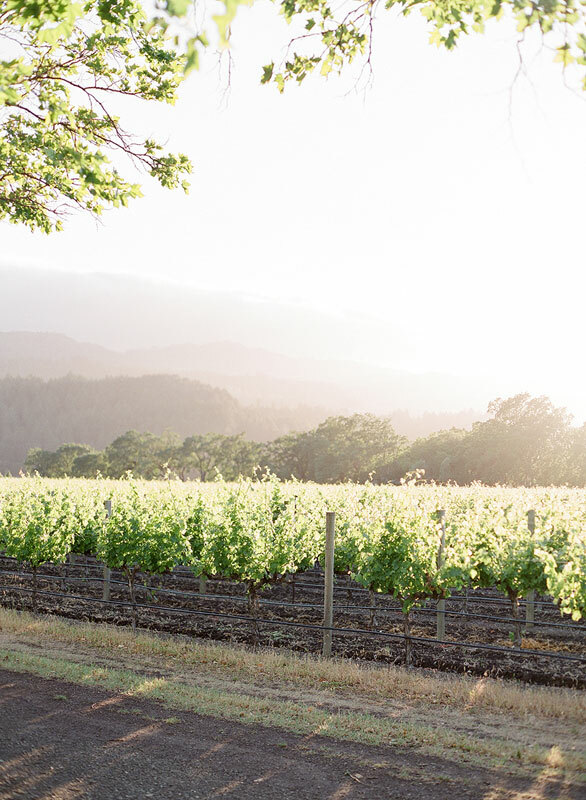 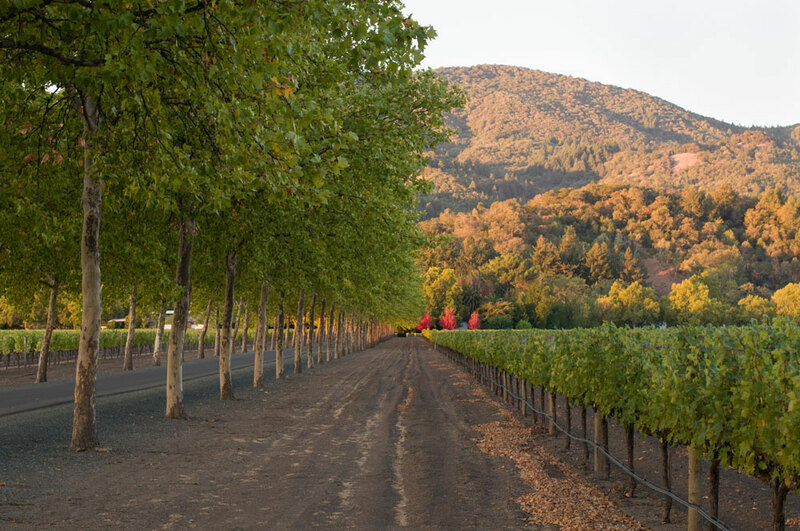 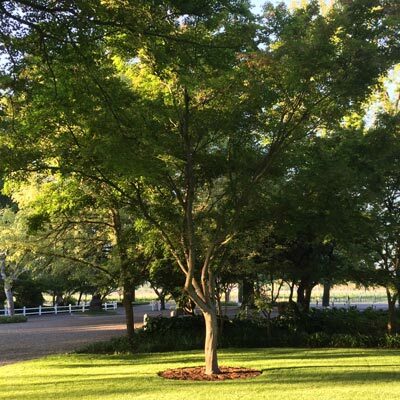 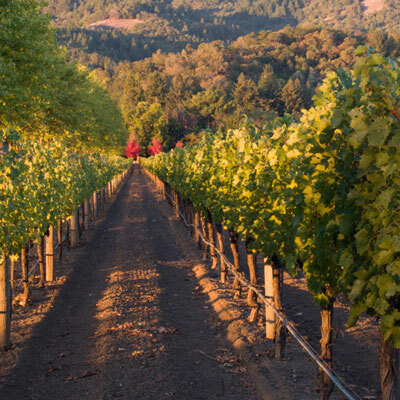 In addition to producing world class wines, the vineyard is also revered for its long history and distinctive beauty, making it popular for photographers. 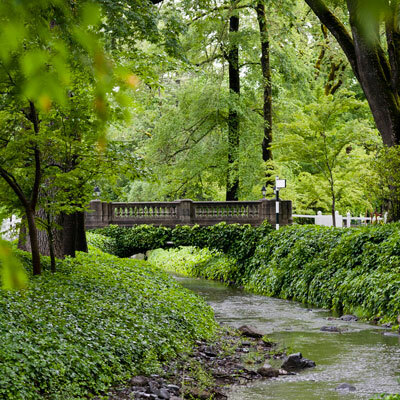 Spring brings new growth and lots of green. 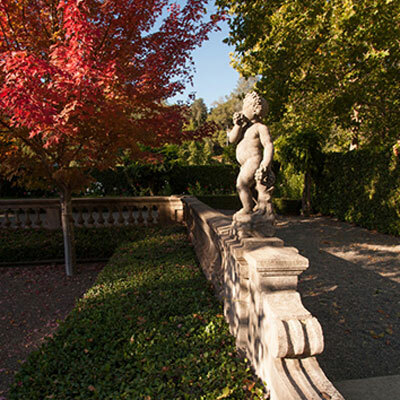 Summer foliage is vibrant and autumn beauty brings splashes of color in September and October. 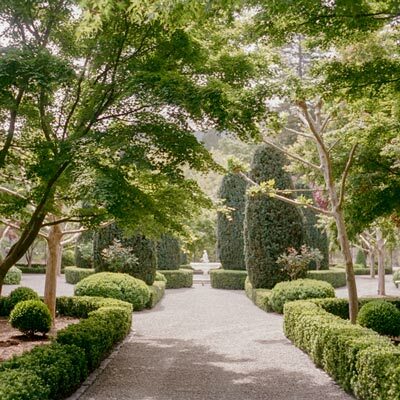 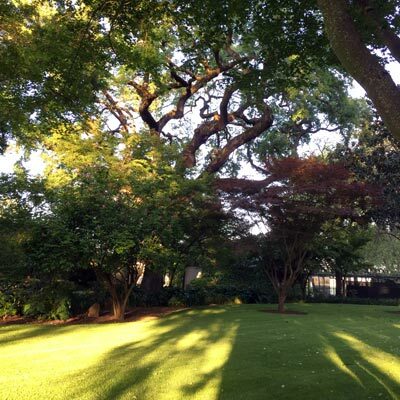 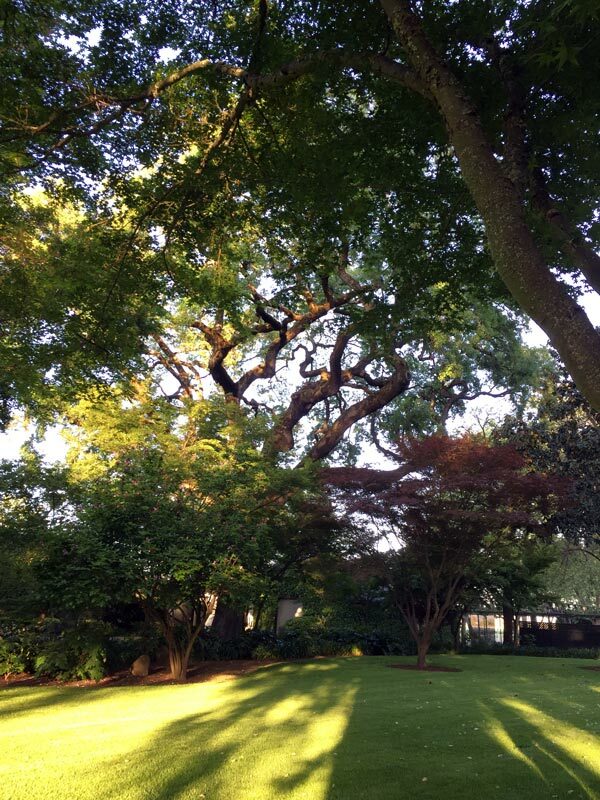 Majestic 300-year-old California Oak trees are intertwined in an extensive lawn with magnolia, sycamore, and maple trees, hydrangeas, camellias, oak leaf hydrangeas, azaleas, and agapanthus. 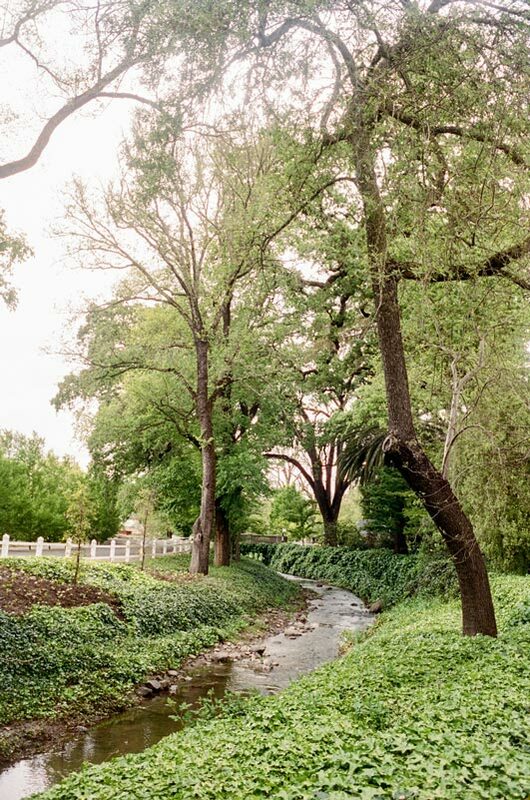 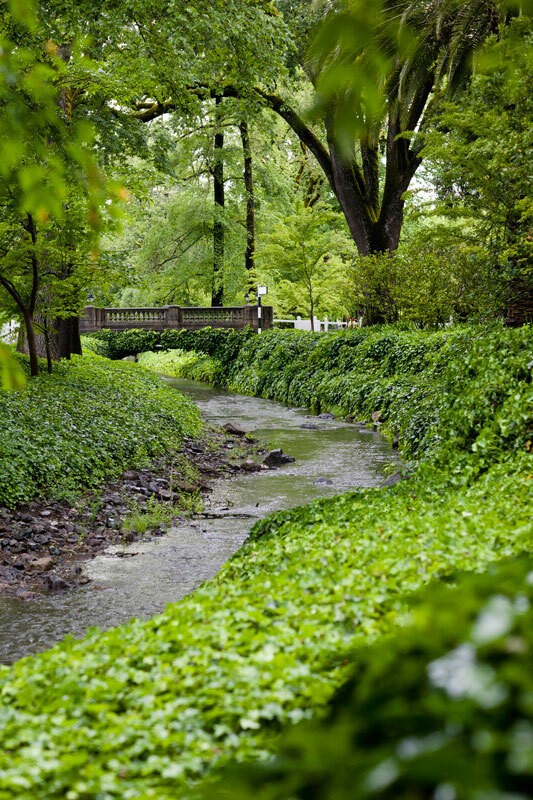 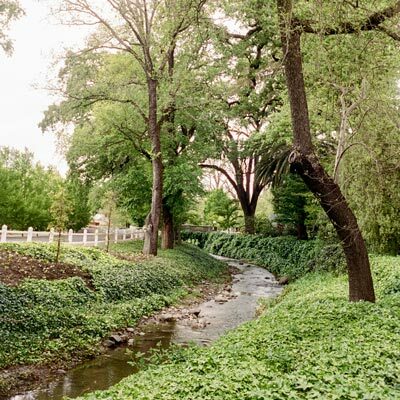 The park area is adjacent to a lovely meandering creek that runs through the property.